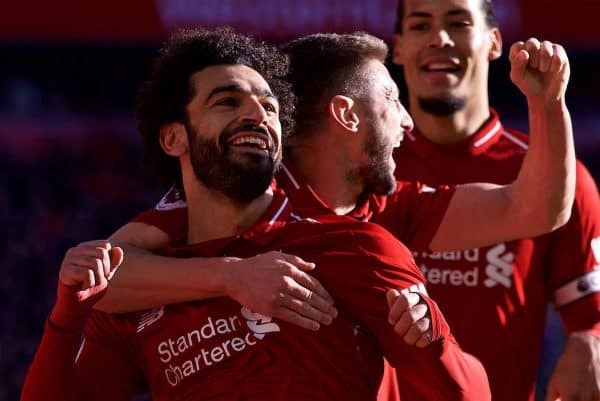 Liverpool took their time but eventually sealed another emphatic victory as they brushed Cardiff City aside to win 4-1 and go top of the Premier League. After back-to-back victories over Huddersfield and Red Star, Liverpool took on newly promoted Cardiff at Anfield in another favourable clash on paper. League leaders Man City are in action on Monday night at Tottenham, giving the Reds an opportunity to leapfrog them into pole position with a win. Jurgen Klopp sprang a surprise, however, as he fielded an arguably weakened side as Dejan Lovren, Alberto Moreno and Adam Lallana replaced Joe Gomez, Andy Robertson and Xherdan Shaqiri. Taking on a Cardiff side buoyed by a 4-2 win over Fulham last time out, the pressure was on an altered Liverpool to take the three points. In front of a passionate home crowd, the Reds kept up their form and made sure of their place at the top. After the success of his 4-2-3-1 formation in midweek, Klopp kept faith in the system with Lallana assuming duties on the right wing as Roberto Firmino remained in the No. 10. 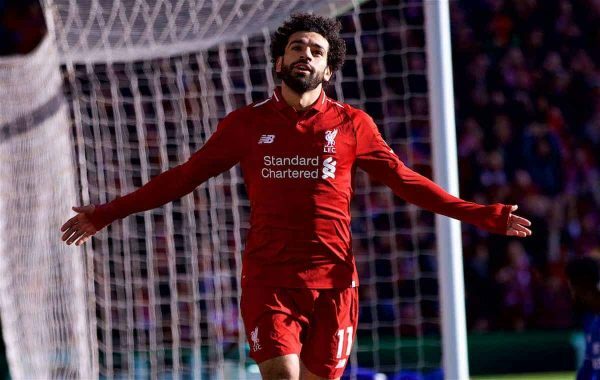 It looked set up to be a frustrating game for both players and supporters alike, but Mohamed Salah put paid to Cardiff’s rigid defence as his sweeping run saw him eventually power home after two blocked shots. This led to a barrage of attempts at Neil Etheridge’s goal, with captain Virgil van Dijk hitting the post, Salah just short in a one-on-one and then at the heart of an unsuccessful penalty appeal. Cardiff made a rare foray forward as they outnumbered the Liverpool back line, but Fabinho was on hand with a brilliant last-ditch tackle to win the ball cleanly and thwart the danger. Lallana had a header cleared off the line with the last touch of the first half, as the Reds were forced to settle for a 1-0 lead going into the break. Cardiff gave the hosts a jolt early into the second half as Sean Morrison’s header was turned in only to be ruled out for offside, serving as a reminder of Liverpool’s slender advantage. The game continued to play out at a difficult pace, with the Reds seemingly in need of a change and Shaqiri presenting himself as the most suitable option to regain control, replacing Lallana after one too many Cruyff turns. Liverpool began to find openings in the final third again as a result, and the defining chance fell to Sadio Mane who, after a poor initial touch, fired the cleanest of efforts home. It wasn’t smooth sailing for Klopp’s side, however, as Junior Hoilett’s low cross was diverted past Alisson via Callum Paterson after a deflection from Van Dijk to make it 2-1. 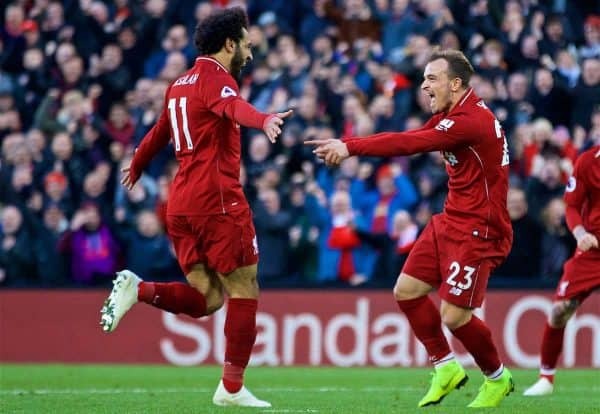 But it fell to the substitute, Shaqiri, to pass in his first goal for the club after Salah found him in the box to guarantee the three points as Liverpool move to the top of the Premier League. That wasn’t to be it, however, as a swift break saw Salah lay on a sumptuous pass for Mane to clip past Etheridge for his 50th Premier League goal and the win.